A wireless keyboard and mouse combo is a practical choice, whether you are into gaming, working or simply browsing through thousands of Internet pages every day. It’s great for portability, maneuverability and for making cleaner desk spaces. It is a versatile, economic and wise option for computer input peripherals. Looking for a keyboard and a mouse separately takes longer, and you have to consider compatibility between the two peripherals. A wireless keyboard and mouse combo remove the compatibility issue out of the equation as the two are peripherals are designed by manufacturers to work as one. 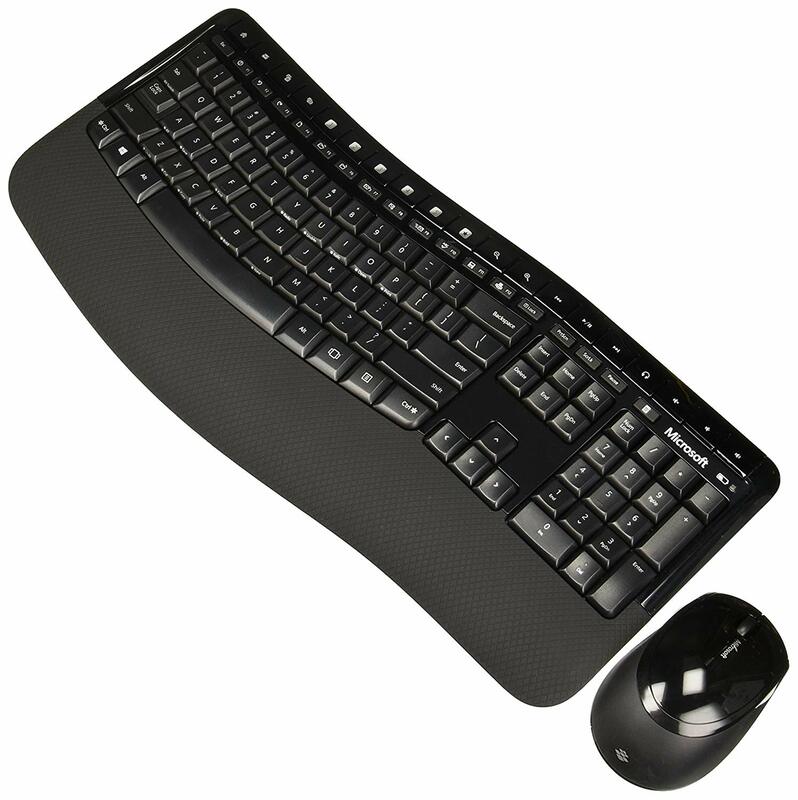 Moreover, wireless keyboards and mice combos have great additional and convenient features that work perfectly work together without having the need to program or configure each peripheral separately. There are hundreds of wireless keyboards and mice combos that can cater to your needs – stylish, advanced, full of additional features, simple, basic, affordable. The options are almost close to limitless. Getting the best wireless keyboard and mouse combo that perfectly fit your needs can make your computing experience more enjoyable, convenient and easy. Take a look at our favorites to help you make your decision. The Logitech Wireless Combo MK520 is considered the best in overall features and aspects for a wireless keyboard and mouse combo. Its keys have soft round edges and are concave. The Logitech Wireless Combo MK520 will also impress you with its amazingly responsive keys that will assure you of lesser typos and more importantly, higher speed. The keyboard comes with silicone dome switches, which supposedly performs quieter, but this Logitech keyboard combo sounds a lot noisier than expected. Not that it is a negative for its performance, in fact, it adds a better sense of feel when punching keys. On top of that, the keyboard feels perfect offering awesome comfortability, and with an additional unpadded palm rest as part of the package adds more ergonomic without sacrificing the wireless keyboard’s portable and slim design. The wireless mouse, on the other hand, is ambidextrous giving great comfort for the hand. It is designed with a high arch and rubber side grips, making the overall mouse comfort experience superbly comfortable. Based on actual tests, the mouse in this Logitech combo performed with very high accuracy. More importantly, the mouse worked great on all types of surfaces – wood, denim, glass, etc. Battery life for the Logitech Wireless Combo MK520 is about a year for one AA cell battery. Compared to its competitors, it sits at the mid-range, which is actually not bad for a performer brand and model. 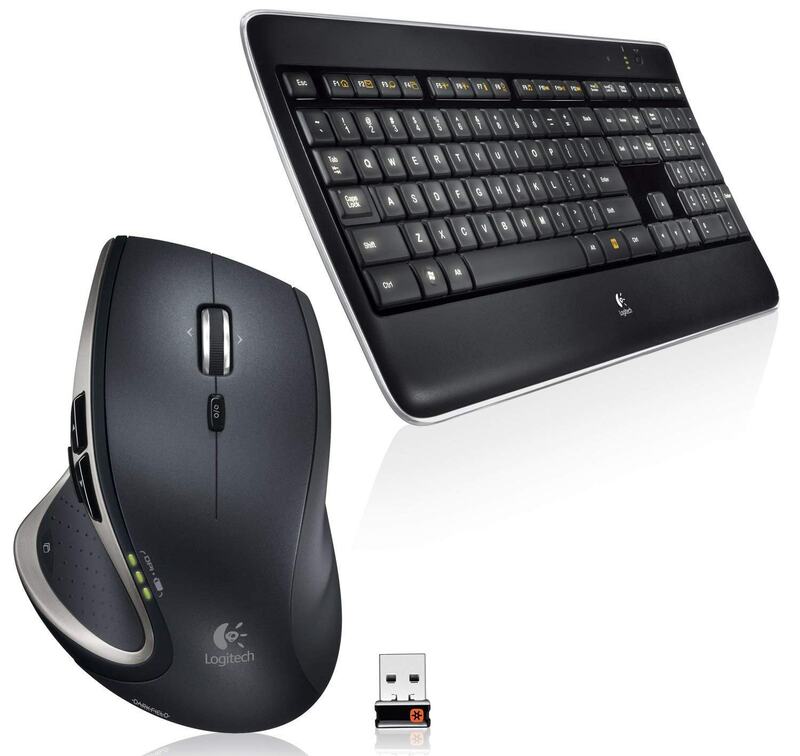 The Logitech Wireless Combo MK520 comes with a standard three-year warranty for the two devices. The Microsoft Wireless Desktop 2000 is one of the wisest buys you’ll ever have for a wireless keyboard and mouse combo. It comes with all the basic features and functionalities of a wireless keyboard and mouse that deliver to your basic computing needs. It comes with an ergonomic design and textured palm rest for higher comfortability. The pillow-textured palm/wrist rest assures you of maximum comfort over long periods of use. The mouse is ambidextrous and comes with rubber side grips. While it comes with a click-free mouse wheel, which is not suitable and ideal for most gamers, the mouse performs agile, accurate and responsive for everyday computing use. Overall, the mouse’s shape, design, and size will work great on your hand in general cases. The Microsoft wireless keyboard also comes with a helpful and convenient program shortcut keys that enable you to fire up your favorite and most frequently used software and application faster and more conveniently. The overall design of the keyboard is neat and professional, with adequately spaced keys to allow for faster and accurate typing. The only thing that you need to watch out for the Microsoft Wireless Desktop 2000 is the connectivity issues if the combo is not set up properly. Other than that, it is an affordable wireless keyboard and mouse combo that offers all the basic keyboard and mouse functionalities. If you are into budget wireless keyboard and mouse while still getting the needed performance and features, the IOGEAR Long Range 2.4 GHz is your best choice. Its reasonable price tag comes with high accuracy and versatility performance for both the keyboard and mouse. The IOGEAR Long Range 2.4 GHz wireless keyboard uses silicon key switches, which performed very quietly during testing. This makes the whole typing experience effortless without much noise. In addition, the keys are concave and feel really soft, which generally reduces strain on the fingers. Some people don’t prefer it while some love the soft feel in every punch. Ultimately, it all boils down to typing preference. Although the IOGEAR wireless keyboard doesn’t have a wrist rest as part of the package, it still offers decent ergonomics and more portability. You can easily and quickly move around if necessary because it is very light. One huge plus for the IOGEAR Long Range 2.4 GHz wireless keyboard and mouse combo is the mouse. It is super comfortable and super accurate. It easily gained an A-rating on the comfort category. The only problem is that it is only offered right-handed. Nevertheless, the mouse has 4-way scrolling, which allows you to change the cursor speed easily, making it very convenient. Furthermore, the mouse worked very well on any surface, such as glass, marble, and wood. The HP Wireless Elite Keyboard and Mouse Combo’s great advantage is portability. It is by far the best portable wireless keyboard and mouse combo out in the market today. It has chiclet-style keys and an excellently slim profile that makes it easier for you to slide in and out of your laptop bag. The HP Wireless Elite Keyboard and Mouse Combo is perfect for travelers, commuters and those who are always moving with their keyboard and mouse. It is one great, portable and convenient accessory. Both the keyboard and mouse are tested to be very responsive and accurate, making the combo a great choice for typists. Moreover, the keyboard has a shallow actuation point, which is just 2mm, allowing you for a lighter touch and lesser force when typing. This consequently results in better, faster, quieter, and more accurate typing. This makes the keyboard comparable to laptop keyboards. The mouse in this combo is ambidextrous and performs very well on any type of surfaces, such as carpet, denim, glass, and wood. This makes the mouse a perfect portable and convenient mouse for travel. Some people might find the larger palm arch on the mouse a little bit uneasy, especially for those with smaller hands. Nonetheless, it is not a deal breaker. The wireless keyboard and mouse combo are powered by using 2 AA cell batteries and connects to your computer through a USB dongle included in the package. You can also connect up to 5 different devices using one dongle if you use HP’s Link 5 technology. Amazingly comfortable design is what makes the Logitech Wireless Performance Combo MX800 a great choice. On top of that, it will surprise with additional features you don’t expect from a typical wireless keyboard and mouse combo. The Logitech Wireless Performance Combo MX800 is built for extreme precision and silence. It is exceptionally responsive, remarkably accurate and surprisingly quiet. The keyboard design is also very slim making it very light and portable. On top of that, the keyboard has an outstanding intelligent backlighting capability that auto-illuminates to enable you to work in dark-lit places a lot easier. The only thing lacking with the keyboard is an ergonomic and curved layout. The mouse is large has an excellent restful design making your hands fully sit on it with ease. The only problem is that it is only offered right-handed and some people find the large size a bit strenuous. Also, the Logitech Wireless Performance Combo MX800 comes with a bit of a price. So, if you are willing to pay more for all these features, then you can never go wrong with the MX800 combo. The Microsoft Wireless Comfort Desktop 5050 aces it up with the best in ergonomic design. And, it runs its competitors by a mile. The keyboard in this combo comes with varied key sizes and a superbly comfortable wrist/arm rest. On top of that, the mouse in the combo is ambidextrous that will surprise you the moment you use it. The keyboard is undoubtedly different from the rest of its class as it offers a beautifully curved design that aims for a close-to-perfect and better fit for your hands. It breathes and screams ergonomic effortlessly. What makes it more amazing are the large B and N keys that will definitely surprise you with lesser typos and a much faster typing performance. Moreover, the keyboard comes with a nice sloped wrist rest that will make your hand placement really comfortable. One noteworthy feature is the shortcuts printed on the many various letters. There are shortcuts that allow you to complete common actions, such as copy and paste, and so forth. There are just a ton of shortcuts the keyboard recognizes, which will help your typing experience a lot more convenient. The mouse, on the other hand, is ambidextrous and fits comfortably with most hand sizes. The arch is designed to be moderately high and the size is not too big nor small. You can easily have a tight grip on the mouse, you’ll forget you’re even holding it while moving or maneuvering it around. Both the wireless keyboard and mouse operates using two AA batteries but they both eat up a lot of power, giving you a shorter battery life, which is just about 8 months. However, battery replacement is a lot inexpensive, especially when you use rechargeable types. They’re also easy to find and are mostly available in all stores. The wireless keyboard and mouse work great on any type of surfaces, except for glass. This is just normal for laser type of mice but not at all a deal breaker. The Logitech Wireless Desktop MK710 is perfectly designed for desktops. It has soft key switches and a long wrist cushion providing you with great relief for a longer period of use. Moreover, the Logitech Wireless Desktop MK710 combo has a longer battery life compared to the combos in this list and it comes with an LCD status dashboard, which is really outstanding for a permanent fitting at your desktop computer. While the Logitech Wireless Desktop MK710 appears to be the bulkiest, biggest and heaviest keyboard in our list, it never fails to deliver on its promised features. It is not designed to be portable but the comfort it gives through its wrist rest by far gives it a wide edge. It uses silicone key switches and 1.75 mm actuation that result in quieter typing. The keys may not be spaced too generously but each key cap has a concave design that provides a better typing experience and reduced typing errors. The mouse is only offered right-handed but makes up with a four-way scroll wheel, rubber side grips, and moderate arch. Even though it is not ambidextrous, the mouse has been tested to be extremely comfortable, working and fitting perfectly for most hand sizes. The Logitech Wireless Desktop MK710 combo uses 2 AA cell batteries for power and has outstanding battery life, which can last up to 3 years from first use. It ranks as having one of the highest battery life among wireless keyboard and mouse combos available in the market today. On top of that, it comes with a standard 3-year warranty. Most keyboards today come with a variety of additional program hotkeys that enable you to open apps faster with one push. Other keyboards have built-in multimedia controls that enable you to adjust screen brightness, volume and so forth that allows for a more uninterruptible computing experience. There are other great key features that come with a wireless keyboard and mouse combo. Be on the lookout for these key features to help you better decide on your buy. Mice nowadays come in a variety of shapes, sizes, designs, and added buttons and functions. Not all mice are created equal. The important things that you should be diligent about would be mice with textured or rubberized grips that come with a contoured and ambidextrous design. This type of mice works best in longer periods of usage – this is great ergonomics. Another thing to keep in mind is the suitability and comfortability of the mouse to your hand – especially if you are right-handed or left-handed. Finally, one crucial element to consider is the size of the mouse and how it fits your palm – the smaller or the bigger mouse, the huge its impact to your gameplay or overall computing experience. Always keep in mind comfort and what best works with your hand. Since wireless keyboards and mice combos rely on the power of batteries, scrutinizing the battery life of the model you are eyeing on is critical. Most keyboards and mice combos are powered by AA or AAA cell batteries. You can opt for models that come with rechargeable batteries or you can purchase the rechargeable batteries separately if you want to be more economical. But then again, you will have to recharge every time the batteries run out. There are also newer models that come solar powered – these are new technology wireless keyboards and mice that look convenient since you won’t have to use cell batteries. A couple of things you need to learn is that a typical wireless keyboard should last from a year to 3 years with one battery set and a typical wireless mouse should last from 8 months up to 2 years. However, all of these depend on how frequent you use the wireless keyboard and mouse, and what you use them for. Always weigh in on battery life and reliability for a wiser, regretless buy. Keyboards come with a variety of shapes, designs, weights, and sizes. There are wireless keyboards that offer the best ergonomics that reduce wrist fatigue. Others come with generous spacing between keys but are also bigger in overall keyboard size – they normally eat up significant desk space. Some keyboards have avant-garde and futuristic designs that integrate ergonomics and functionalities as part of their deals. Whatever shape and design of the keyboard you are going to consider, always keep in mind comfort and durability – something that you can use for a very long period of time while you put a lot of stress onto it.